My roommate can't believe this, but Creme de la Mer doesn't work for my skin. It's too heavy and leaves behind a cakey feel. Luckily, La Mer The Moisturizing Gel Cream is just right. What I love about this moisturizer is that it's unbelievably fresh and cooling. It sinks into skin automatically with no greasy residue. I'd compare the consistency to Clinique Moisture Surge Extended Thirst Relief. This makes it perfect year-round -- not too heavy in the summer, not too light in the winter. La Mer's patented Miracle Broth is, of course, part of the formula. Other ingredients include lime tea (an antioxidant that protects against external environmental factors) and sea kelp (a natural humectant). The end result? Hydrated, moisturized, conditioned skin that feels superlight and airy. It's definitely on the pricey side, as La Mer products tend to be -- but if you want to treat yourself, it's the perfect splurge. What more could you ask for? 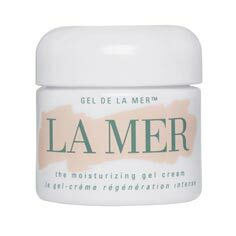 La Mer The Moisturizing Gel Cream is $275 at blissworld.com. Why does 'La Mer' never do any type of Giveaways? If I'm spending THAT much, I'd want to try it first!! !